The Congress on Tuesday held consultations in New Delhi to finalise candidates for the December seven Legislative Assembly elections in Telangana, party sources said. 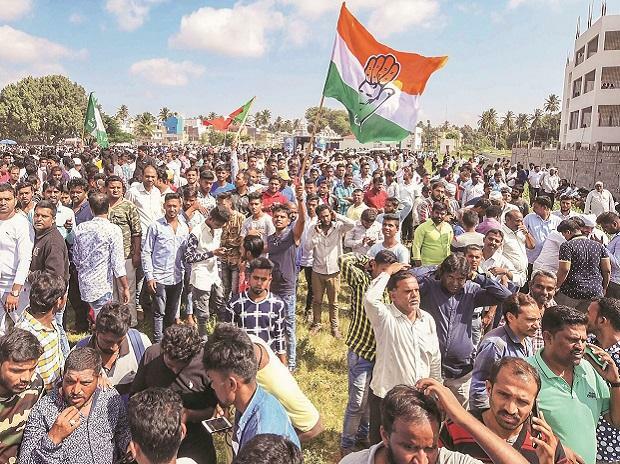 Telangana Pradesh Congress Committee (TPCC) president N Uttam Kumar Reddy and other leaders were part of the consultations with the party's screening committee for finalisation of nominees, they said. Congress is leading the proposed "grand alliance" which also comprised TDP, CPI and Telangana Jana Samiti (TJS). AICC incharge of party affairs in Telangana RC Khuntia said here Monday that the seat-sharing among the parties would be finalised by November 9. "Talks are on with all. It has nearly concluded. You will come to know by (November) 9th. There is no problem in seat sharing of the alliance," he had said. TJS sources claimed Tuesday that the Congress offered 11 seats to the party as part of the ongoing talks on seat-sharing and others. There are a total of 119 assembly seats in Telangana. The Gazette notification for the polls will be issued on November 12 and the last date of nominations is November 19, according to the schedule released by the Election Commission. The TDP, TJS and CPI are reportedly seeking 18, 14, and at least five seats respectively. Meanwhile, the ruling TRS continued its attack on the "grand alliance." Rama Rao, son of TRS president and Caretaker Chief Minister K Chandrasekhar Rao, has been attacking the "grand alliance", saying that the alliance between Congress and TDP is against the basic principles on which the latter was founded by late N T Rama Rao.